Eric Worre is one of my personal heroes in the network marketing industry. He’s a legend in our industry and most importantly, he’s also an ambassador to the industry. I consider Eric Worre as one of my best mentors. He is the founder of Network Marketing Pro. He’s been a top producer in several companies. He’s owned his own MLM Company. He has more than 20 years experience in this industry. What I admire most about Eric is that he tells you the things you need to hear, not just what you want to hear. Of course, he does this in a professional way, so it doesn’t insult you or make you angry. Another thing I really admire about Eric Worre is the VALUE that he provides to our industry. While he’s achieved great success himself, he also gives back and shares his knowledge with everyone, free of charge. He shares everything he’s learned through his own experience and he tells people exactly what they need to do to succeed in their business. He doesn’t sugar coat stuff and he won’t try to hype you up either. He just gives you the information you need to succeed, and lets you do what you want to do with that information. Most importantly, he is an ambassador to the industry. He doesn’t try to recruit you into anything and he does what he can to improve the overall reputation of our industry. Listed below, I want to share five things I learned from Eric Worre, the founder of Network Marketing Pro®. They are listed in no particular order. All I can say is that each lesson has had a profound impact in my business and in my life. # 1 Don’t Pay Attention to the Money, Focus on Building Your Skills Instead. My Take: Most people who get involved in our industry initially do so to make money. And there’s nothing wrong with that. Unfortunately, most of these new people have zero sales, marketing and entrepreneurial experience (or skills). As a result, they struggle with their business and normally quit in 90 days or less. Eric teaches the importance of focusing on building your skill-set and mind-set, first. For most distributors this will take them a few years to do! Most people have never owned a business before and don’t know how to “think” like a successful business person. And most distributors lack sales and marketing skills, so they have to take the time and money to develop those skills. I’ve also learned from personal experience that most businesses take a few years to get profitable. During those first few years, you are incubating, paying your dues and learning the ropes! If you give up too soon, you’re really doing yourself an injustice. Yes, you need to make money to survive, but don’t let the money alone determine whether or not you keep building your business. As long as you are growing and developing new skills, and making some progress in your business each month, your business will eventually make it. My Take: Whether you have a business or a job, you get paid based upon the value you bring to the market place. There are no exceptions to this rule! To grow your network marketing business, you need to focus on providing value to others. Before you can provide value to others, you have to develop your skill-set and mind-set (as mentioned above). Once you have those two things in place, you need to be the leader who offers solutions to other people’s problems. When you can show others how to generate leads, how to use systems, how to recruit properly, how to blog your way to success, or any other skills, people will naturally be attracted to you and want to join your team. When you offer value, you won’t need to sell, convince, chase, pressure or bug anyone. You will be the hunted, not the hunter. Focus on helping people, not selling people. Always find ways to increase your value to the marketplace and your business will naturally grow. # 3 Be a Professional – Treat Your Network Marketing Business As If It Is Already A Million Dollar Business. Act As Professionally As a Fortune 500 CEO Would Act. Be A Professional At All Times. My Take: This industry is filled with amateurs who give our industry a bad reputation. One of the quickest ways to separate yourself from the masses in our industry is to be a professional. To do so, you must educate yourself about the industry. You must be a student of the industry and be a student of your own business. You must have integrity and hold yourself to a higher standard. You must never lie or deceive your prospect. You must act as if everything you are doing is being watched under a microscope. Be a professional at all times. By being professional, you will (1) get better results in your business, (2) help improve our industry’s reputation and (3) you will be respected and regarded in high esteem by people inside and outside of our industry. # 4 90 Days Can Change Your Life – Successful Distributors Work Their Business Consistently, But They Build It In 90-Day Spurts. My Take: Momentum is one of the most important words in a network marketer’s vocabulary. While you should be in it for the long-haul, you must take small bursts of massive action. This is frequently referred to as a 90-day challenge. This is when you “sell out” to your business for 90-days at a time, so you can grow your business quickly. Building a business fast is much easier than building it slowly. People say that this industry is the easiest profession in the world when you work hard and built it fast, and the hardest profession in the world when you work slowly. Commit to doing a day 90-Day Challenge in your business. Set some “high level” goals, develop an action plan and then take massive action. You’ve got nothing to lose and everything to gain. # 5 The Journey is Everything – The Way to Be Happy In Life And In Network Marketing Is to Remember That The Journey Is Everything. Success Is Not a Destination. My Take: I was fortunate to learn this lesson a few years back (thanks, Eric). I used to be so obsessed about reaching the next phase of my life. That was a big mistake that caused lots of depression and unhappiness. You need to realize that life is a journey. It is called the present because it is a gift. The past should be cherished, but don’t live in the past. The future should be exciting, too, but don’t live in the future. The only way to be happy is to live in the moment. In addition, you need to realize that reaching your goals won’t make you happy. Earning millions in the industry won’t make you happy, either. The only thing that will make you happy is if you live in the moment and enjoy each day of journey. This is simple, but life-changing advice. If you haven’t studied Eric Worre’s materials before, please do yourself a favor and check out his Network Marketing Pro website. 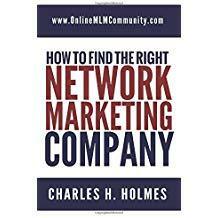 It is a great resource to teach you the skill-set and mind-set you need to take your network marketing business to the next level. He also has books, training courses and seminars available. If you’ve studied Eric Worre before, or worked with him personally, I would love to hear from you. Just leave a comment to share your thoughts. And Eric, if you ever read this post yourself, I just want to say THANK YOU for all you have done for me! I hope I can have even a 10% impact on others like you have on me. 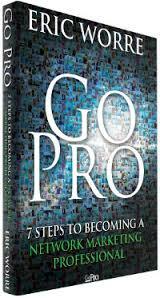 Read My Review of His Book Go Pro! Disclaimer: Network Marketing Pro is a registered trademark. This IS NOT a paid endorsement. It is simply my opinion. I’ve actually just read about Eric Worre on this site. The 90 Days can Change Your Life part makes me slightly nervous. It’s not his advice that does it, it’s the intense and drive it takes for 90 days. I’m sure most people fade out well before 90 days. It takes a lot of stamina. I especially like the part, though where he says it’s about the journey, not the destination. If I can remember that, I can do anything! When it comes to doing a 90 day challenge in ANYTHING, most people will fade away and quit. This applies to New Year’s Resolutions, diets, savings goals, and just about anything else. Few people have the discipline to be successful in anything. I am really grateful that I found Eric Worre’s website “Network Marketing Pro” a couple years ago. I’ve watched just about every video on his website and the training has helped me immensely. Right after I joined my company my sponsor quit and I had no one to help me. I now have my entire team plugged in to Eric’s website and my team grows every month. Thank you Eric! His website has changed my life and business. I am really grateful for Eric Worre, too. Here’s a quote by Eric Worre that I really like. “The pros don’t present themselves as experts; they just invite people to learn more about the products or business opportunity and let the third-party resource provide the information.” Ever since I started doing that in my business I have seen a really big shift. That is some great advice, Ocha. I remember reading about that in his book “Go Pro.” I think using third party tools is the only “smart” way to build your business. Keep things new and simple for your newest distributor. Don’t make the mistake of doing a complex business presentation where your prospect thinks they could never do that. Work smart and use the tools! He is very inspiring. I try to watch three of four of his videos every week to give me new ideas, to check my attitude and to learn better ways to build my network marketing business. years to become best they can be,and that is John Haremza,I am glad he is comming this week, June the 4th to Toronto where he is having a free seminar great opportunity to attend and learn from the best.I will be there! John is another great leader in our industry who has experienced tremendous success and offers a lot of value. You can’t go wrong if you follow his lead. I just read Eric Worre’s new book “Go Pro.” My sponsor suggested I read it, so I ordered it on Amazon and really liked it. It is short and to the point and loaded with good information. I give it 5 of 5 stars. Glad you enjoyed it Hernando. I just finished this book myself after being led to it by someone I know in the MLM industry. I’d have to say that I really loved this book because it provided a lot of information in such a simple format. Some books that discuss these sorts of topics are so complicated that you just want to put it down immediately. I got through the book in about three days and learned so much. I would readily recommend “Go Pro” to anyone in this industry. It is a source of really valuable information. I’ve learned so much from Eric Worre during the past four years. His Network Marketing Pro is hands down my favorite website online for network marketers. He provides so much value and help for people in our industry, without ever pitching his primary business on you. I think every serious network marketer should study this guy and learn everything they can from him. I’m glad he has helped you too, Bridget. Other than Mike Dillard and Mark Yarnell, Eric Worre has been the most influential person in my business and personal development. I’ve been following Network Marketing Pro and Eric Worre since he launched the site a little more than three years ago. I think I’ve watched just about every video on his site. Eric provides so much value and gives so much back to people in our industry. He is an amazing leader and deserves all the success he has achieved. That’s great, Randy, that you are committed to studying someone who has a strong track record in success with MLM, and choosing Eric Worre is definitely a leader in MLM. His videos are great tools for increasing your skill set, and I find him to be highly motivating. I agree with you that he deserves his success in MLM because of his hard work and strong character. I agree, Chuck. Eric Worre is top leader. And to get where he is at in the MLM business, did not happen in a day. It took him years to get where he is today, so the best advice one can get is to learn from the leaders like Eric. If you did that you would shorten your journey and avoid a LOT mistakes. Good points, Ivan. Success takes time. Eric does provide a lot of value, Randy. And that’s exactly WHY he has become so successful. I was referred to you by Caesar Kihoro and feel humbled to connect with you for I know You will be of help in building my Vemma Business. I look forward to getting to know you Stephen. The fact that Eric Wore has 20 years of experience in his field is incredible to me. I am so young and so the idea of being somewhere for 20 seems like so much to me. The commitment and dedication it takes to stick with an idea or company even when things get challenging is a lot. I think the problem with people in my generation is that we weren’t really taught to stick it out. If things get too tough or don’t happen fast enough we just give up an move on. More dedication would probably lead to more success. If you want to succeed in something, you have to stick it out for the long haul. There are many people in this industry who have been with the same company for 30 to 40 or more years. When you find something good, get started, take massive action and never quit. I find Eric Worre interesting as well, especially his focus on value. As you noted in #2, providing value is of prime importance. It is important to understand that what has value to one person does not have value to another; consequently, various viewpoints must be considered when exploring the concept of value. Your own, initially, for if the product or service you are marketing does not have value to you, the lack of belief and passion will be evident. The value of who you represent, or your company, must also be considered and understood. Finally, though certainly of no less importance, is understanding what the customer or the audience values, in the short and long terms. Eric Worre provides tons of value on his videos, books, training and websites. I’d bet that he doesn’t even have to recruit for his business. Most people probably hunt him down and ask to join his team. Make a note of that readers. That’s what the best leaders do. Provide value and everything else will fall in place. That’s definitely some great advice Della. Success in network marketing really boils down to a lot of people doing a little bit, consistently over a period of months and years.